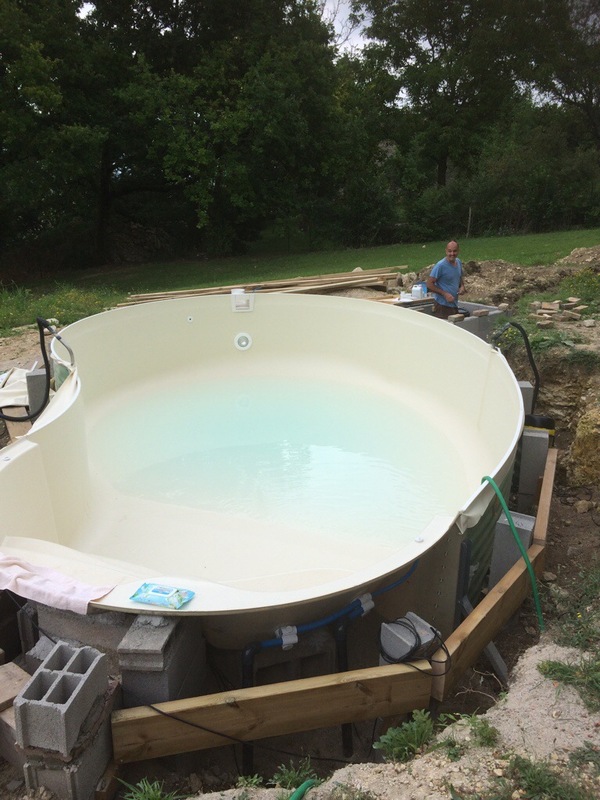 Our pool is finally full up with water and our electrician Michele has made all the connections so the pump and lights are working. Now to back fill all around it, put the marvels on and do all the 150 square meters of decking… easy! 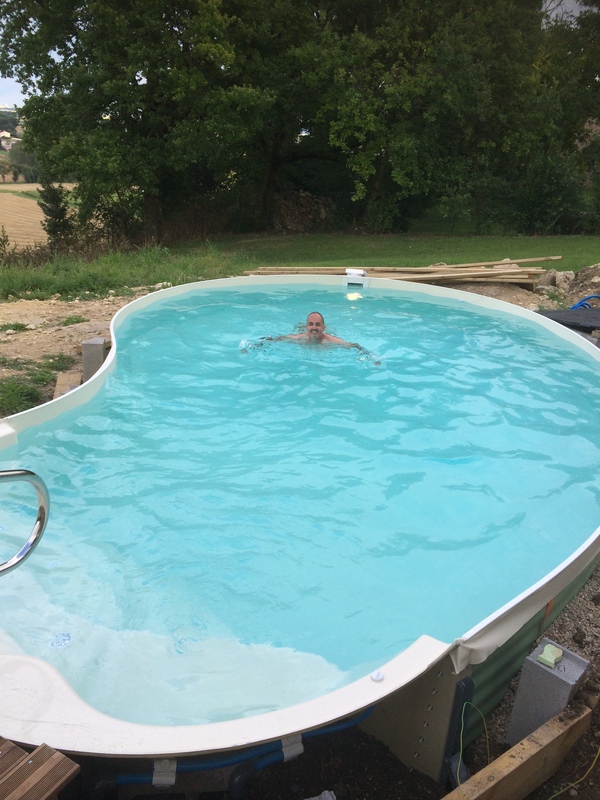 At last our pool liner has been fitted and now we have to wait for it to fill up with water which will take about two days. Now it’s time for decking, lots of decking….. The pool has to fill up to the first step then we take out the hoover poles which are keeping the liner tight and let gravity do the rest. I can’t believe its time for me to be heading back to the Uk for my week of work, where does the time go? The last three weeks have really flown by, is it me or are you all experiencing this? Maybe its just me getting older, when i was a kid the days and weeks were really long especially the summer holidays, they seemed to go on forever, but no more, now i look at the clock and the hands are speeding around, its more noticeable here in my village as the church bells go off three times a day, 8am to tell us its time for work, 12pm to tell us its time for lunch and 7pm to tell us its time for a drink!!! thats way to late should be more like 5pm , so say i. Anyway i have been a busy boy this week with lots of computer work done and some really lovely sociable happenings. Heres some photos of what my week has been about, i do hope you have all had a great week too, tomorrow i head for Toulouse airport bound for London Heathrow and then on up to Edinburgh as I’m working in New Lanark next week, and theres Kev homeward bound from Abuja, he will get in at about 12.30am and ill leave at 8.30am, ships passing in the night, hey ho thats how we have been together for 18 years i guess, absence makes the hart grow fonder so they say. He has a busy week ahead of him as he has to get the pool ready for the liner to be fitted on the 28th, no stress then??? 150 Square meters of it, the delivery guy was amazing using his remote control gadget to off load it. Our lovely friend Migs came for Lunch and i cooked a tart using the goodies from the potager with local goats cheese and good old cheddar that Kevs mum brought over yummy. Heres the finished tart, it didn’t stay like that for long. Dancing under the stars and lots of lovely wine, what a fab way to spend a Thursday evening. A puppy from the local farm game a visiting, followed by his mum wanting to know he had gone, Emily and the kids fell in love with him, so did i he is soooo cute, they have named him Humphrey and he is, he was leant to them for a short while, but alas his mum wanted him back. Miel Miaow continues to entertain us, Friday i was hunting for her as i was going to visit Emily and Ed and found her in the stables all cached down in the rags, but she p[opped her head up to tell me she was there. Humph what you want me to come down, why I’m all comfy!!!! 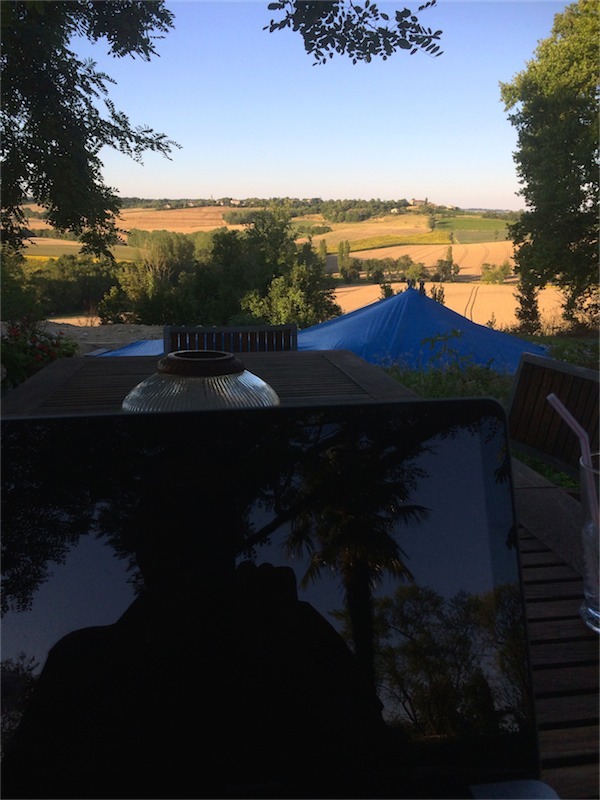 Its been such a fabulous week weatherise and on Thursday the temperature topped 42 degrees in the garden, very sweaty oh how i have been looking at our pool and wising it finished…. Heres to a successful visit to the UK, i wish you all a very happy week ahead. Mary, Mary quite contrary how does your potager grow? Very nicely thank you in fact its growing like crazy it must be the combination of all the sunshine and rain oh and perhaps all the manure i put down in April. We have had a bumper crop of peas, the second crop are growing nicely, the lettuce have been amazing and have now bolted skywards so new ones need to go in soon. Busy day today shopping this morning as all the stores were closed yesterday, it was Bastille day so a national holiday and many celebrations and fireworks. Some computer work, then three loads of washing! where does it all come from? Walked the pickle or rather he walked me and then filling in trenches and back filling the pool. Here are some snaps of the day, i had to take them, even thug i have loads already, i am just in awe at how beautiful it is here. Wednesday tomorrow so midway through the week, happy midweek everyone. A view across the sunflower fields to our village and house, can you spot it? Pickle enjoying the sunshine and asking me to do the buttercup test on his chin…. Mmm where did that mouse go left? We all love to talk about the weather, for some of us its a favourite past time, mainly because in the UK we are always complaining about our weather and lack of sunshine. Here in South West France you get more sunshine hours than the UK but not always when you expect them, e.g. New Years day for instance was a wonderful sunny day with 26 degrees at lunchtime, but July and August are supposed to be the most sunny and hot months of the year, but not this year it appears, July so far has been a mixed bag of mainly cloud, storms,wind and rain, which many of my French friends and neighbours are all talking about, which brings a smile to my face as its usually us Brits doing that. They are all horrified at the weather and are stomping around in jumpers and coats with gloomy faces, they keep assuring themselves that the sun will be back soon, which I’m sure it will be, in fact this coming week its due to be back to a normal 30 to 36 degrees, so smiles will resume I’m sure. Now usually i would be the one complaining about the weather, but as we have had so much work to do, installing our new pool and digging trenches to house the hundreds of neater of safety trunking for our garden power, water and data cables for internet all around the garden, [well yes as we spend loads of time in the garden i want to be able to access the internet now and again] so no long face for me, Kev and i have been smiling as its been cool great to work in, we have managed to get so much done, in-between the rain storms, but i will also be glad to see the sunshine again this week. Marion and Ian have been down with us for the last two weeks and have been busy renovating their house and helping us with the pool. Ian’s brother Boris and his wife Lynn stopped off for a few days on their driving holiday around France. We managed to persuade the rain to take a brief break to give us a few nights of eating in the garden which was lovely. And now the fields are beginning to turn summer yellow as the sunflowers are bursting open to bathe us with their golden glow. Here are a few snaps of the past weeks happenings. Marion and Lynn having fun with wellie boots after taking BP for his walkies. The sky may be grey but the fields are turning summer yellow. All standing to attention presenting themselves to the sun. Huge stunning flower heads swelled with pollen which the honey bees are loving. 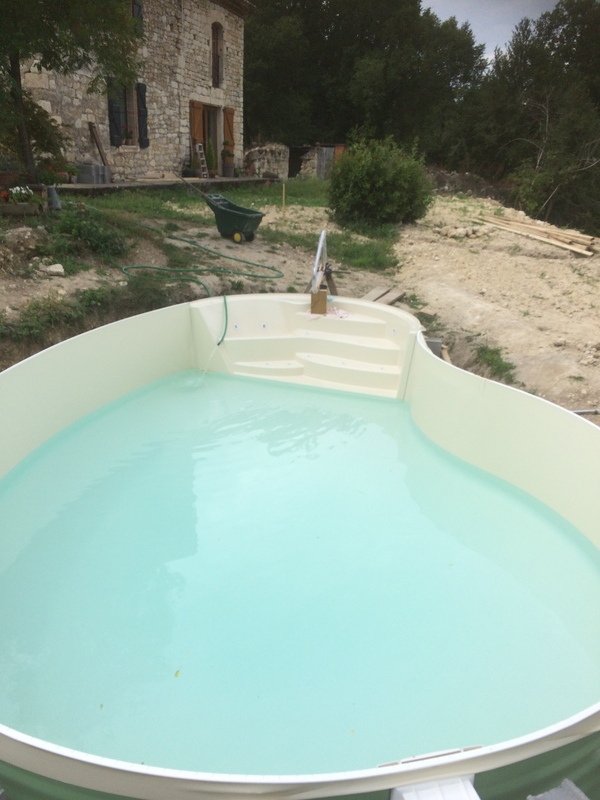 But at last the worst is over and the concrete base it down and set and boy was it a hard job, it was like an oven working inside the walls of the pool, good for burning off calories though. Now just a pump house to build and digging out a trench for the drain, connecting all the pipe work, backfilling all around it, building a concrete platform for the coping stones to rest on, installing the steps, oh and yes about 50 square meters of decking to install….. so nearly finished….. NOT. We had our annual village fete dinner last Saturday and the sun gave us some lovely last rays of the day, the square was decked out, the wine flowed and lots of food was devoured by a hungry crowed. It was a really great evening and so well attended by everyone in the village and surrounding hamlets, we are so lucky to live in such a fabulous village and count our blessings every day, over a glass of rose of course. What Marion with an empty glass!!!! Second jazz band of the evening.